PROTEC17 | Empowering workers. Empowering change. PROTEC17 is the unified voice of some of the most hard-working professionals in the public sector, who provide essential services to our local communities. PROTEC17 fights for fairness, equal opportunity and dignity in the workplace, ensuring every member can succeed professionally and personally. We work tirelessly with employers to provide strong family wages, worker-friendly policies, a safe working environment, good benefits, workplace support, and training. PROTEC17 members are problem solvers who have a wide variety of experience and specialized skills that are crucial to the smooth operation of public services. By standing together in the workplace, PROTEC17 members advocate for better lives for themselves, their colleagues, their families, and our communities. PROTEC17 membership provides a wide range benefits that enhance the lives of our members and their families, as well as access to resources that allow members to achieve their professional and personal goals. PROTEC17 is celebrating 100 years and looking forward to the next century of championing workers’ rights! 1918: A small group of marine draftsmen in a Seattle shipyard form the first incarnation of PROTEC17, and take part in the Seattle General Strike of 1919, which originates in the shipyards. 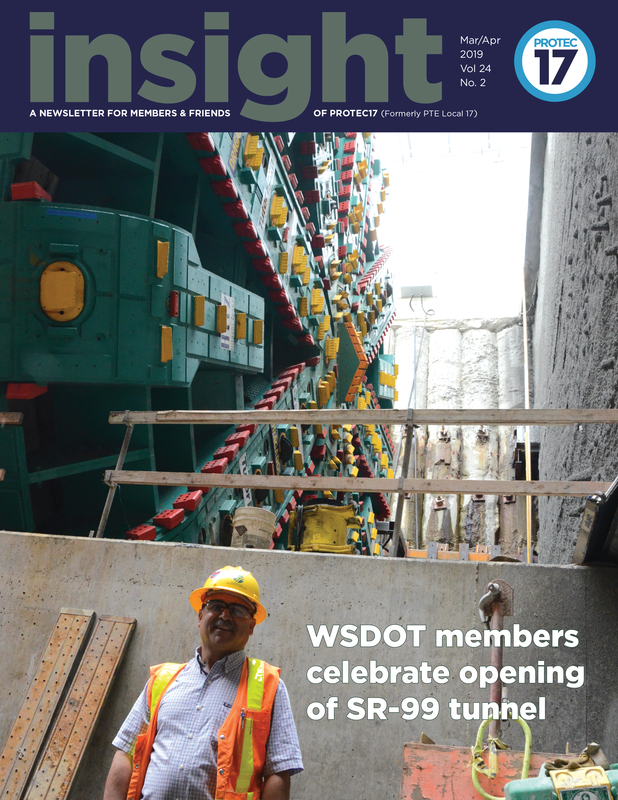 1927: The Seattle Association of Technical Engineers and Architects, Local 17 is chartered under the International Federation of Technical Engineers, Architects and Draftsmen’s Union by more than 100 City of Seattle Engineers on October 24. Dues are one dollar a month. 1942: PROTEC17 gained jurisdiction over the entire state of Washington in order to more effectively represent the needs of professional engineers in the region. Our name is changed to the Technical Engineers and Architects Association. Membership nears 1000. 1947: The State Employees’ Retirement Bill is signed into law by Washington State Gov. Mon C. Wallgren. The bill was prepared and sponsored by PROTEC17 to establish a retirement system for state employees. 1953: The International changes its name to the American Federation of Technical Engineers, and PROTEC17 becomes the Professional and Technical Engineers Association. 1967: The Washington State Legislature passes the Public Employee Collective Bargaining Act. PROTEC17 begins to expand its membership to non-engineering classifications in cities and counties. 1974: The City of Seattle bargaining unit is opened up to clerical staff, marking an expansion in represented classifications across the Union. 1980: Membership reaches 3400 members and continues to grow throughout the 1980s and 1990s after expanding into representing Public Health jurisdictions. 1994: PROTEC17 sponsors the Transportation Safety Act which improved safety standards and protections for those who work on Washington’s roadways. 1999: PROTEC17 takes part in the infamous World Trade Organization (WTO) protests in downtown Seattle. 2011: The policy-making body of PROTEC17 votes to disaffiliate from the International Federation of Professional and Technical Engineers (IFPTE), and becomes an independent union under the name Professional and Technical Employees (PTE) Local 17. 2013: PROTEC17 expands into Oregon after the City of Portland Professional Employees Association (COPPEA) votes to join, bringing an additional 800 members on board. 2018: PROTEC17 celebrates 100 years! The website is redesigned and we change our moniker to PROTEC17. Despite a ruling by the U.S. Supreme Court that makes public sector unionism more difficult, membership continues to climb, reaching nearly 9000 members.